You know how you go to a fair or a carnival or whatever and there is a rock climbing wall and an extremely long line and you don’t want to stand in line for 16 hours so you tell your kids, “We’re not going to stand in line for this climbing wall, but there is a climbing gym in town and I promise I will take you there soon, okay?” And, then, for the next two years, they’re all, “When are we going to go rock climbing?” and you finally have to step up and actually take them? 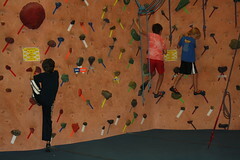 I found a local rock climbing gym called Earth Treks and discovered that they had a Friday night climbing class for kids. I was really glad to find this because it meant that I didn’t have to figure out how to help my kids climb myself, because that seemed like a lot of work that, frankly, I wasn’t capable of. Outsourcing the climbing instruction seemed like just the thing. Our climbing date was this week and we headed out, two-thirds of my climbers excited to be going. It turns out that Quinn was worried about falling, so once I told him he’d be in a harness and totally safe, he felt a little better. 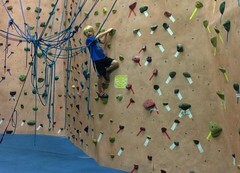 Then, when we got to the gym and he saw all the climbing walls, he freaked out and started yelling about wanting to climb the really tall walls. So then three out of three were excited. This was shaping up to be a really positive thing. We found the right wall section and met our staffers. Early arriving kids got to traverse around the bottom section of the rock wall and all three of my kids were thrilled. The problem—and you know there was one—is that the class wasn’t all that well organized. This particular class was over its limit also, meaning there were 12 kids, instead of ten. Plus, two out of the three instructors weren’t very organized with their lines, meaning pushy kids were allowed to cut. This was problematic for Quinn, because even though he is pushy, he has a really hard time standing in line. 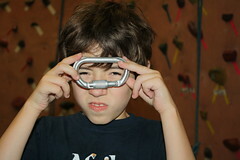 Several kids had climbed twice by the time Quinn got his first climb. For some kids that might not have been a big deal, but Quinn totally fell apart. 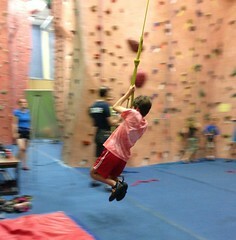 Before he even ended up at the front of a line, he was sobbing and whining and saying he didn’t want to climb anymore. For a kid who had been super excited to be there 20 minutes earlier, it was quite a change and it made me really sad for him. It was also problematic for Sam because he was polite and he got the shaft a couple of times until he finally gave up and didn’t climb any more. More on that later. Let’s start with the great stuff though. Jack jumped in a line with a great staffer who was paying attention to her line. 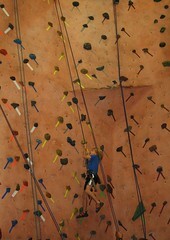 He climbed a couple times, making it to the top of the wall like a rock star. 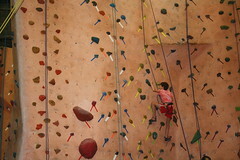 He even took the time to learn some of the climbing terms from the placard on the wall. It was ADORBS. 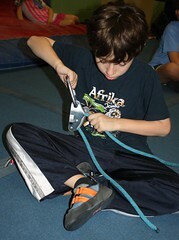 Jack then took the opportunity to explore the climbing equipment and spent a lot of time figuring out how to make it work. His staffer was really cool about letting him figure it all out. She showed him knots and was altogether really cool with him. The carabiner was his gateway gadget. I have no idea what this piece of equipment does, but I think that Jack does. 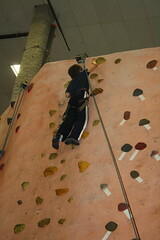 Sam did a great job climbing, but he has a fear of heights. He has actually climbed a wall before and did great, but it was too much for him today. He came down after only going halfway up. He wanted to try again later, but he ended up getting cut in front of and by that time only one staffer was helping kids climb and the others were running a “game,” which really just involved swinging on a rope swing (which, honestly, we could have done pretty much anywhere), so when the kid who cut in front of him took an extremely long time to climb, Sam eventually gave up. It made me incredibly mad and was a big part of my feeling unsatisfied with the whole experience. Sam wanted to climb more, and probably could have done better and maybe conquered a fear, but he didn’t get to, even though that is what we signed up—and paid $29 a kid—for. He looked awesome when he did climb, though. Quinn also only made it halfway up on his first climb. He got really scared and kind of froze. I told him that I was really proud of him (because I was—making the kind of effort he did was fantastic) and that he didn’t have to climb anymore. He managed to sort of calm himself down and decided he wanted to try again. Fortunately (? ), he’s pushy, so he managed to get another half climb. This was his first climb. His technique was a little haphazard. The whole set up was a little weird. The class was 2-1/2 hours, but after an hour and a half, they stopped climbing and started the rope swinging game. By this time, the instructors were also kind of drifting in and out, meaning there were only two instructors the 12 kids for a big chunk of time. 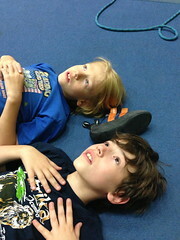 Sam liked swinging on the rope and did it a few times, but Jack and Quinn ended up just lying on the floor. Something we could do almost anywhere. Something we could do literally anywhere. We were supposed to be there until 9, but all three of my kids were bored by 8:30, so we took off. Maybe they did something awesome after we left, but if something manages to bore ALL THREE OF MY CHILDREN at the same time? Well, that is quite a thing. I guess I’m glad we went because my kiddos got a chance to try climbing and if they want to try it again, we can find another way to do it. I do feel a little bit like if it had been better organized though that they might have had a better chance at liking it. I think the staffers were competent and kept everyone safe, but I seriously wanted to jump in and line kids up and keep everyone ordered. The addition of the extra kids made the wait lines so much longer as well. I bought our tickets for the class in June to get a night where there was room for all of us. I’m annoyed that it turns out that you can just show up and push your way to the front of the line. 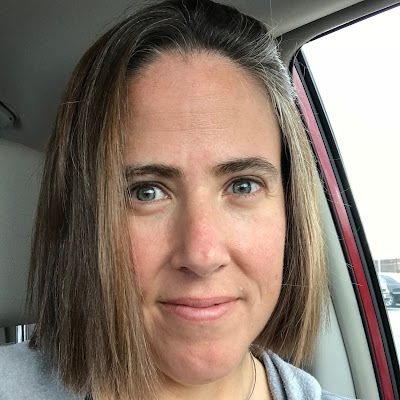 Even though I’m glad I took my kids for the experience, I am really mad that I didn’t step up for my kids enough—especially Sam. I should have been pushy for him. Instead, I let him learn that if you are polite, you get the shaft. I’m also mad that I have to feel that way. The climbing gym should have done a better job with class organization. When we left early, one staffer said, “Oh, are you leaving?” and no one else said anything. I was angry all the way home. I think my kids had a decent enough time, but I just ended up annoyed. I’m trying really hard to remember that I gave my kids an experience that they wanted and now that they know what it is like, if they express interest in doing it again, we can find a one-on-one way to do it next time. Although to be honest, I doubt they’ll ask again. If they never do ask to go climbing again, at least they’ll always have traversing.